Giga came down with a double case of the flu and school work so you'll have to check back during the week to see how the Mages did with their job interview. Thanks to DarkAura from Dragonfly Cave for giving us her services with this guest comic. It's great that we've got fans who are so willing to help us out. 1. 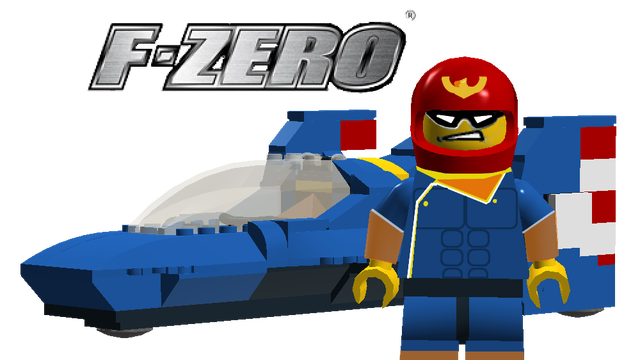 I've started a drive to get F-Zero lego made, in particular a Lego Blue Falcon complete with a Captain Falcon Minifigure that can FALCON PUNCH! To make this a reality I need 10,000 supports on Lego Cuusoo, Lego's design submission site. It sounds like a big number but every vote counts so give us your assistance All you need is your Facebook or Twitter account so click right here and let your voice be heard. Oh, and while you are there give your support to these other projects for Lego Metroid, Lego Megaman and Lego Pokemon. 2. I've been doing work on a Card Game with hybrid Turn Based Strategy/RPG elements... Wow, I can't do marketing speak. But anyway, I decided the logical step would be to make it a download game rather than selling my soul to Wizards of the Coast to get a physical version but I have very little experience with any kind of programming so I'm looking for someone to help make a rough beta to work out the kinks. If you're interested PM me and we can discuss it further. Payment is possible but considering I'm a college student writing this on a 4 year old laptop with a taped on battery, don't expect top dollar (or pound or Euro depending on where you are). 3. If you are part of our test reader group, I've put two new scripts for you to have a look at up. Send your feedback when you can. If you want to join, PM me. 4. As always, rate, subscribe and comment! Ratings let us know how good each comic is, Subscriptions let us know how popular the comic is overall and comments let us know how awesome all of you are. Today's guest comic features Hugh from Pokémon Black & White 2. I haven't had the chance to try either game yet (holding out for X & Y instead), but it's a funny comic regardless! lego captain falcon looks sweet. did you make it yourself? I made the set in Lego Digital Designer and added Captain Falcon's details onto an otherwise Plain Minifigure body. If you want it to be a real thing vote for it on Lego Cuusoo. Oh yay, this was posted! Ha, I know that technically that Glasses Gardevoir is a disease(mental illness, whatever), since it stems from Gardevoir's schizophrenia, which is a disease, but personally, I think Glasses Gardevoir herself isn't a disease. So yeah, that's inb4 people who say it is a mental illness. Or maybe she actually is one. I don't know. After all, I'm not the psychiatrist here! Ahaha! Woops. I got that fixed now. The English Lanuage needs more gender neutral stuff to avoid that kind of thing. Still, not as bad as French. Every freaking inanimate object is male or female. Spanish, too. Don't forget Spanish. "I'm about to unleash my rage!"